Jeff is a USPTR certified tennis professional and a 5.0 USTA tennis player –with over 17 years of on-court and teaching experience. He enjoys coaching and developing youth and adults through collaboration, discipline, mentorship, and, most importantly – having fun! 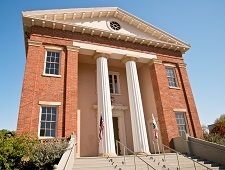 Jeff is also a local insurance broker in downtown Benicia – serving the needs of auto, home, and life insurance. Raf is a USPTR certified tennis professional, and a tennis enthusiast, who enjoys playing tennis regularly - through USTA League and social tennis. He has a deep passion of working with youth to help develop their skills on-and-off the court. For tennis related questions, contact Coach Jeff at jeffwongtennis@gmail.com or Coach Raf at fineartmaps@me.com. Both coaches offer privates lessons as well! Note: Programs run year-round, except during winter. This 40-minute class is designed for beginners looking to have fun while they learn. 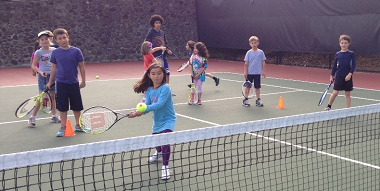 Aspiring Wimbledon Champs will work on forehands and backhands, eye-hand coordination, balance, and focus. The coaches will utilize an interactive method of working in pairs and/or teams. In addition, they will use low compression balls as well individualized court sizes! Income Assistance: Up to 50% (based on income). Contact Megan at 746-4285 for eligibility. Equipment Needed: Junior tennis racket (17 to 21 inches works best) and tennis/sport shoes. Cancellation Policy: You can cancel up to 1 classe, which will be prorated off the total fee. This class is designed for beginner to advanced-level adult tennis players. The fun drills and games will help all different levels learn and improve their strokes, as well as develop their singles and doubles strategy. There will be two courts available - one for the beginning group - and the second for more advanced players. The coaches will uniquely incorporate the two groups in each session to help blend the experience levels - for a fun learning experience for everyone! Equipment Needed: Tennis racket and tennis/sport shoes. 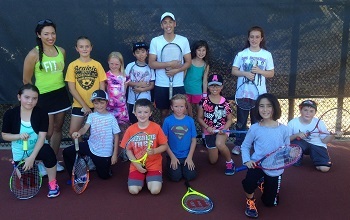 This class is designed for the beginning/intermediate level tennis players who are ages 10 and under. Players will learn and/or improve all their strokes, as wellas learn and develop singles and doubles strategies. The coaches will utilize an interactive method of working in pairs and/or teams. In addition, they will use low compression balls as well individualized court sizes! There will be two courts available - one for the beginning group - and the second for more advanced players. The coaches will uniquely incorporate the two groups in each session to help blend the experience levels - for a fun learning experience for everyone! Ages: 10 years & under (6 to 10 years old). Cancellation Policy: You can cancel up to 2 classes, which will be prorated off the total fee. Learn how to play tennis! 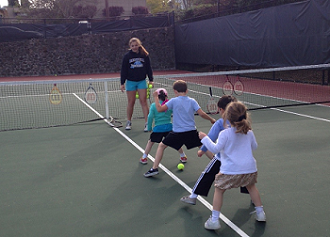 Classes cover the basics – to advanced levels of tennis from start to play. This class covers the basic mechanics of forehand, backhand, overhead, serve and volley. By the end of this class, players will know how to play matches and keep score. There will be two courts available - one for the beginning group - and the second for more advanced players. The coaches will uniquely incorporate the two groups in each session to help blend the experience levels - for a fun learning experience for everyone! The dedication of Jeffrey Wong Insurance Agency to the Benicia, CA community goes beyond just providing sound insurance to keep our neighbors safe. Jeff and the team are dedicated to building the community up through every avenue available, from exceptional risk management solutions to fun and education out on the courts. See you this summer!